Whether you plotted your Marketing Action Plan on a big wall or Google calendar, or even a spreadsheet of your own making, this is your plan to succeed and evaluate as only you can. If you did indeed create measurable goals, then as you execute each step of your plan you should start to see results, or at least the steps which will lead to the resulting leap. It’s important to stick to your plan and to share your plan with friends and family, so they can help you in any way you ask. Sometimes just their knowing you have a plan you are determined to succeed at is enough. Often getting their help in sticking with your schedule, preserving your creative time and space, or helping bolster you when it’s time for those sales calls is all so-so valuable. Then get down and track those measurable items, how many collections, presentations sent, sales leads and sales calls. The last step is to compare your results to your goals. The more detailed you are in each step, the more you’ll be able to adjust your goals and tactics in coming years, as the objectives change and get bigger! We are coming now to the final step of the MAP (Marketing Action Plan), where you actually put the tactics on your calendar. It’s important to double check that each one of your tactics is detailed enough, so that it includes how much time daily, weekly, monthly you need to achieve the results you want, as well as what budget you’ll require and assistance you’ll need. It’s only with this level of detail will you be able to execute your tactics. The final Marketing Action Plan will be something you will live and work with every day, so you also want it to be realistic. You may find as you fill in all the blanks that you have bitten off more than you can chew, or that you simply are ignoring important aspects of reaching your financial and other goals. A common mistake is to create a great portfolio, but never allocate the time, energy or budget to building a relevant lead list and/or not following-up with phone calls and emails after sending a collection presentations to manufacturers. I recommend starting by placing trade shows, product signings and other events that are not ‘moveable’ on your calendar first when laying out your annual Marketing Action Plan. Make sure you review your promotional tools and create whatever sales materials are needed for trade shows, direct mailings, public relations, etc. Then work backwards to give yourself time to complete them before they are needed. Have you addressed each objective with tactics that will actually make a difference and achieve those goals? If you don’t know what to do, how can you find out? Who can you talk with to create those tactics and learn what to do? Have you considered your personal life and all it entails, so that you are being realistic about your timing and goals? Have you allocated budget to each tactics and goal, and is there enough money to achieve your goals, or do you need to hold off on some items until another year? If so, how does that affect the outcome of your other objectives? When you look at this Marketing Action Plan, do you get excited about the prospect of all you can achieve or does the look and feel of it overwhelm you? If it’s the second, your plan still needs some tweaking. I hope over the last couple of weeks you have thought about your business in a new detailed way. Now it is time to take all that knowledge and create your marketing goals. Goals are a very interesting breed of objectives. These targets create the purpose for your every activity related to business and they have some very specific qualities. Remember that goals need to be quantifiable, which means measurable in marketing language. And you need to have goals that are related to sales. For art licensors, I suggest you start with identifying your new, or first, cornerstone product categories. Here is where you identify that you want to license your art on sports equipment, housewares, party supplies, stationery, greeting cards, gift items or domestics. Here is where you should target how many deals/licenses you want to close during the year and how many new retail products you want on the shelves in the future. I suggest you also create other achievements as goals, such as brand awareness, audience exposure and product demand, which will create leverage for future deals. So write out your key goals, those that will help you build revenue in your business. 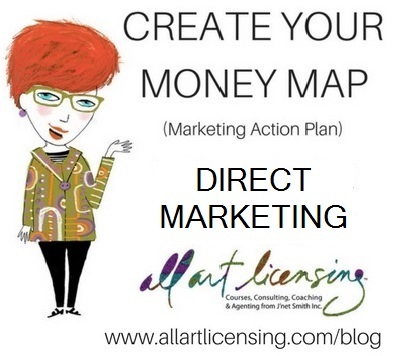 When thinking about putting direct marketing on your MAP (Marketing Action Plan) and subsequently onto your calendar, you will want to consider a plan for releasing new collections that you can stick to. If you are developing collections for a trade show, then perhaps pick 2 or at the most 3 other times during the year to launch your latest work. Your direct marketing should include updating your website, sending sales letters (or emails), and launching direct mail campaigns (electronic or printed) for each wave of new collections created. You can do your direct mailing campaigns to via a low-cost (Constant Contact) or no-cost (Mail Chimp) email service. But be aware that if you send a generic piece to an email list, it is likely your email, whether a promotion or a portfolio release will go to their spam folder. Avoid this pitfall by collecting personal names and emails whenever possible. These services can usually get an email into their personal in-box if it includes their name. Other alternatives include sending individual emails to clients and prospects with one PDF attached or a link to a new section of your online portfolio, as well as the old-fashioned and still impressive (yet wildly more expensive) direct mail piece. Direct marketing needs to be scheduled so you don’t forget to do it. Really, it’s one of the most important promotional tools you have at your fingertips. And don’t forget to try and schedule your efforts around the manufacturers’ trade show schedules. 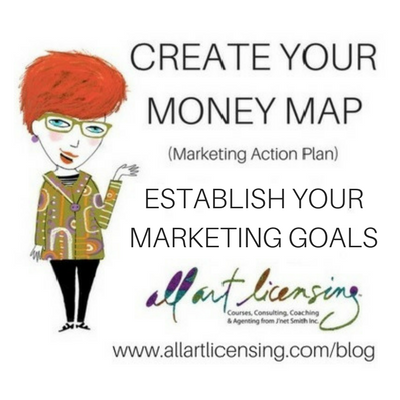 Let’s start creating our Money MAP (Marketing Action Plan) today, by answering the core questions I will outline in this and a few following blog posts. “Who is your target audience?” is a core marketing question which you need to answer. Decide who relates most to your art, men or women? And what age groups are most compelled to like and purchase your designs? Feel free to identify primary and secondary core audiences. But don’t have too many audiences, so that you spread yourself too thin trying to reach a multitude of target audiences. It’s also important not to fall into the ‘everyone’ trap. This is where you decide that everyone likes (or should) like your art, so that’s your defined target audience. It’s a real catch-22 when you try to be all things to all people. Not only is it impossible to market to such a large audience, you wind up being relevant to no one. So target a relevant demographic and once you are successful with them, feel free to expand. But not until you have a foothold with an audience. I encourage you to find an audience that is: 1) identifiable, 2) reachable and 3) sustainable. If you are successful in identifying a niche which has all of these three components, and they in-turn identify greatly with your art, designs or character, you are highly likely to be successful. 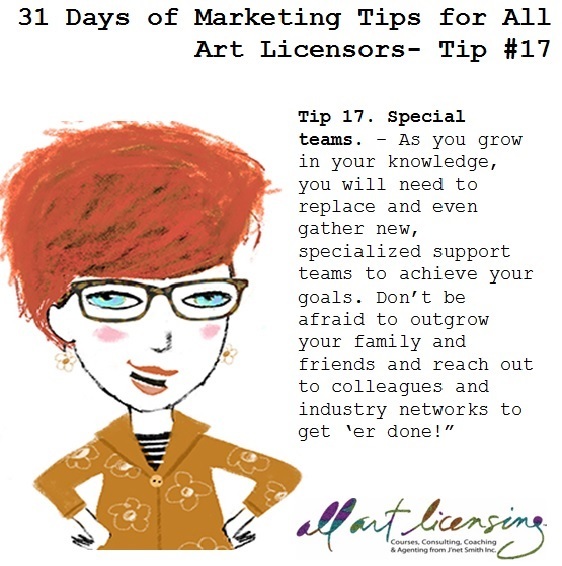 I am always asked by artists how to develop a marketing plan. And more often than not, it’s prefaced by something like, “Why can’t it be simpler and still do the job?” I actually agree; many marketing plans are unwieldy. What you are really looking for is an action plan that takes into consideration who you are, what you can accomplish, and what you must do to achieve your financial goals (and stretch goals). 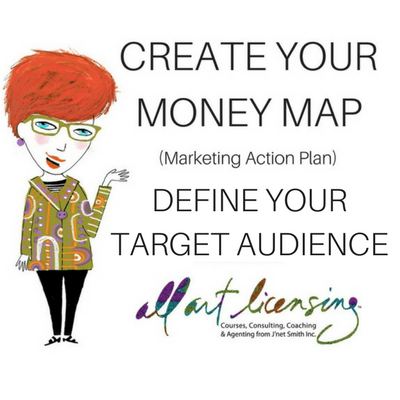 With this in mind, I created a MONEY MAP (Marketing Action Plan) that is designed specifically for artists who want to license their art and accomplish as much as possible this year! I recommend you sign up for our daily RSS feed (button on the right), so you will get the All Art Licensing blog each day in your in-box, so you won’t miss a step of this vital plan. 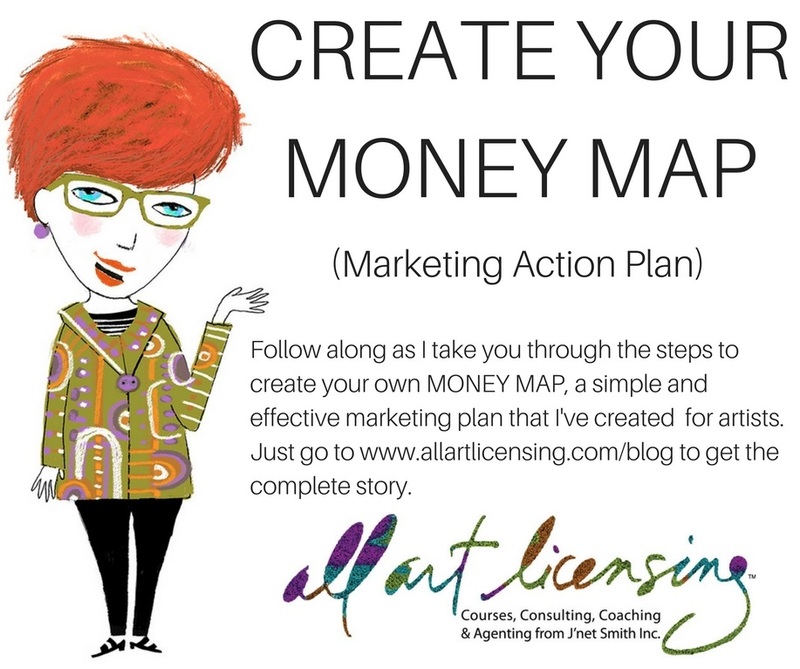 My MONEY MAP is a great way to create an action plan that is thorough, but not as extensive as a full-blown marketing plan. It’s a simplified (and manageable) marketing plan. Follow along daily, as I reveal and explain components of a MAP, so you can create your own. The best way to create a Money MAP (Marketing Action Plan) is to begin by answering the core questions I will outline in the following blog posts. Then at the end I will show you how to apply those answers to a schedule or calendar format. This is your final marketing action plan (MAP) – how you plan to take action and create money.